The Behind the Scenes series entails insight from behind the chef’s counter and a restaurant’s outlook of its past, present, and future. With the spirit of Bastille Day upon us (check out thechicagochic.com for my latest roundup), my favorite and I stress FAVORITE restaurant at the moment is the “flying pig” itself, Cochon Volant. Located in the heart of the loop, dangerously close to my office, this upscale French bistro has been making tidal waves since its opening in April. Conceptualizing the food side of the menu, chefs Roland Liccioni and Matt Ayala serve versions of the quintessential French specialties all day, including a variety of French Dips, piping hot “Croque Madame” egg rolls, classic escargot, and their Frenched up version of a burger, Le Cheesburger Royale. Not to mention, if you’re wanting a different type of lunch/dinner AND if your budget allots, two giant chilled seafood towers are up for grabs. To put it simply and to be brutally honest, anything on Cochon’s menu is really freaking good. On the liquid front, the Cochon Volant team has concocted a remarkable menu to sip down. 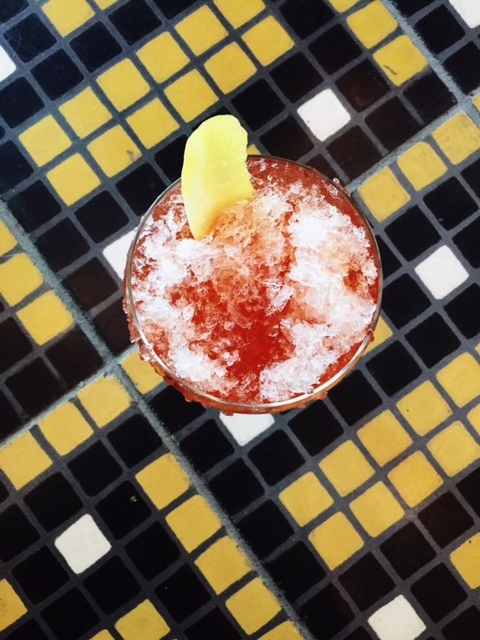 However, the must-have beverage to get is definitely the “daily shave.” Using an old-school ice shaving machine, each cocktail is escalated into a playful but better version of a Hawaiian-shaved-ice. Ranging from bright and citrusy to clean and subtle flavors, the shaves are stiff. I’d almost prefer these drinks to wake me up in the morning, rather than a normal cup of tea/SBX. Where was the original concept derived from? CV team: Cochon Volant is the simple food chef Roland Liccioni use to make for his employees who worked with him in the kitchen (at Les Nomades) that everyone thought was mind blowing. How does CV differ from the other brassieres in the city? CV team: The one thing that is missing in Chicago is a traditional French brassiere and there is no one else who can do that better than chef Roland, chef Matt Ayala, and the rest of the team. Why located in the loop? The loop needs more restaurants! Would you consider lunch delivery for neighboring offices? chef Matt: We do a lot of carry out orders. We could consider lunch delivery for neighboring office buildings, but for now we’re taking it one day at a time. What has been a few crowd favorites? chef Matt: Mussels, Classique, Steak Frites, Croque Madame egg rolls, and the French’d fried chicken wings. Our food menu and cocktail list are approachable. I think there are a lot of favorites for that reason. What’s in the works for Cochon? chef Matt: We’re working on an octopus dish, a nicoise salad, and anything that is in season right now. Although I have unfortunately been anti-French cuisine for a long time (due to previous letdowns and bad experiences), I have absolutely been converted. By being introduced to such an unfamiliar type of food by such an easy-going and playful staff, it’s given me a greater appreciation for what they do on a day to day. I do regret not converting sooner, however, I am very happy that Cochon was my light at the end of the tunnel.